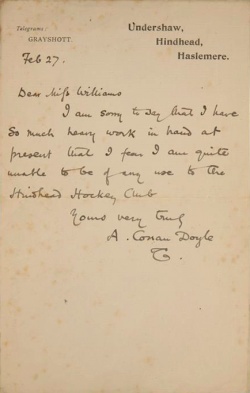 This letter was dictated by Arthur Conan Doyle on 27 february (no year given) from Undershaw, Hindhead, Haslemere, to Mrs. Williams. I am sorry to say that I have so much heavy work in hand at present that I fear I am quite unable to be of any use to the Hindhead Hockey Club. This page was last edited on 2 September 2018, at 19:11.